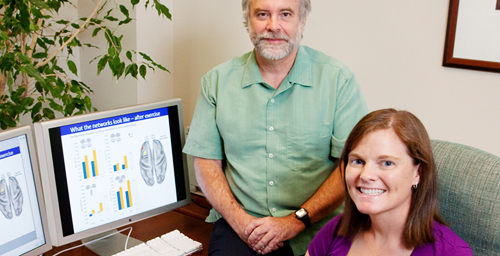 Psychology professor and Beckman Institute director Art Kramer, doctoral student Michelle Voss and their colleagues found that a year of moderate walking improved the connectivity of specific brain networks in older adults. CHAMPAIGN, lll. - A group of "professional couch potatoes," as one researcher described them, has proven that even moderate exercise - in this case walking at one's own pace for 40 minutes three times a week - can enhance the connectivity of important brain circuits, combat declines in brain function associated with aging and increase performance on cognitive tasks. Moderate walking three times per week for a year increased brain connectivity and brain function in older adults, the researchers found. Photo by Elise McAuley for the Exercise Psychology Laboratory at the U. of I. The study, in Frontiers in Aging Neuroscience, followed 65 adults, aged 59 to 80, who joined a walking group or stretching and toning group for a year. All of the participants were sedentary before the study, reporting less than two episodes of physical activity lasting 30 minutes or more in the previous six months. The researchers also measured brain activity in 32 younger (18- to 35-year-old) adults. Rather than focusing on specific brain structures, the study looked at activity in brain regions that function together as networks. "Almost nothing in the brain gets done by one area - it's more of a circuit," said University of Illinois psychology professor and Beckman Institute Director Art Kramer, who led the study with kinesiology and community health professor Edward McAuley and doctoral student Michelle Voss. "These networks can become more or less connected. In general, as we get older, they become less connected, so we were interested in the effects of fitness on connectivity of brain networks that show the most dysfunction with age." Neuroscientists have identified several distinct brain circuits. Perhaps the most intriguing is the default mode network (DMN), which dominates brain activity when a person is least engaged with the outside world - either passively observing something or simply daydreaming. "For example, people with Alzheimer's disease tend to have less activity in the default mode network and they tend to have less connectivity," she said. Low connectivity means that the different parts of the circuit are not operating in sync. Like poorly trained athletes on a rowing team, the brain regions that make up the circuit lack coordination and so do not function at optimal efficiency or speed, Voss said. In a healthy young brain, activity in the DMN quickly diminishes when a person engages in an activity that requires focus on the external environment. Older people, people with Alzheimer's disease and those who are schizophrenic have more difficulty "down-regulating" the DMN so that other brain networks can come to the fore, Kramer said. A recent study by Kramer, Voss and their colleagues found that older adults who are more fit tend to have better connectivity in specific regions of the DMN than their sedentary peers. Those with more connectivity in the DMN also tend to be better at planning, prioritizing, strategizing and multi-tasking. The new study used functional magnetic resonance imaging (fMRI) to determine whether aerobic activity increased connectivity in the DMN or other brain networks. The researchers measured participants' brain connectivity and performance on cognitive tasks at the beginning of the study, at six months and after a year of either walking or toning and stretching. 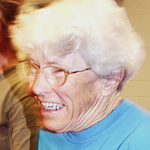 At the end of the year, DMN connectivity was significantly improved in the brains of the older walkers, but not in the stretching and toning group, the researchers report. The walkers also had increased connectivity in parts of another brain circuit (the fronto-executive network, which aids in the performance of complex tasks) and they did significantly better on cognitive tests than their toning and stretching peers. "The higher the connectivity, the better the performance on some of these cognitive tasks, especially the ones we call executive control tasks - things like planning, scheduling, dealing with ambiguity, working memory and multitasking," Kramer said. These are the very skills that tend to decline with aging, he said. This study was supported by the National Institute on Aging at the National Institutes of Health. Editor's note: To contact Art Kramer, call 217-244-8373; e-mail a-kramer@illinois.edu. To reach Michelle Voss, call 217-244-4461; e-mail mvoss@illinois.edu. The paper, “Plasticity of Brain Networks in a Randomized Intervention Trial of Exercise Training in Older Adults,” is availableonline.